Blinds generally come in one of three standard sizes: ½ inch, 1 inch and 2 inches. 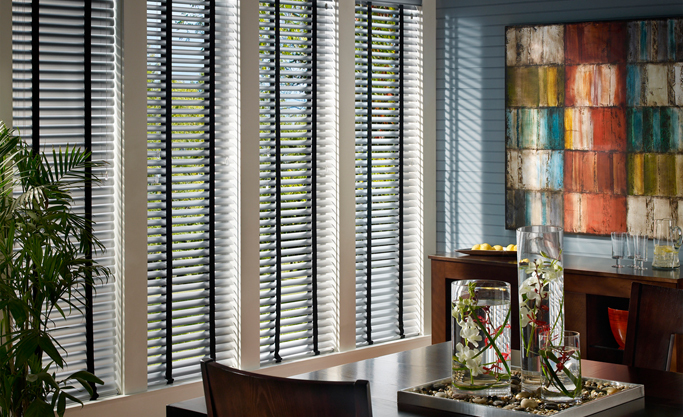 The ½-inch slat is the most popular, because it gives a contemporary feel. The 1-inch version is a compromise between the narrowest and the widest blinds; they take less labor to manufacture than the ½-inch slats, and are slightly less expensive. People who want an old-fashioned or old-world look generally choose the 2-inch slats, which are reminiscent of older-style Venetian blinds. If you want a long-term, classic blind that will neither become dated nor offend a potential buyer, choose a neutral color closest to the color of the window trim. Another choice you will have to make is how your blind raises and lowers. Will it be top-down? Bottom-up? Or a combination of both? Privacy and light issues will be the determining factors in this decision. Wood blinds are another popular option. Wood brings a softer, more organic feel to windows than an aluminum blind does. If you go this route, realize that faux wood has a couple of advantages over the real thing: It can be substantially less expensive, and it’s not as susceptible to moisture issues, which makes it a great choice for bathrooms, kitchens and clammy climates. If you are going to use a painted wood blind, you might as well go faux. Woven woods bring a distinctly organic texture to a room. Their nubby, slubby feel makes them relaxed and comfortable looking. They enhance and warm almost any decor, from modern to country. Also consider the weight of each slat. You’ll get exactly what you pay for.